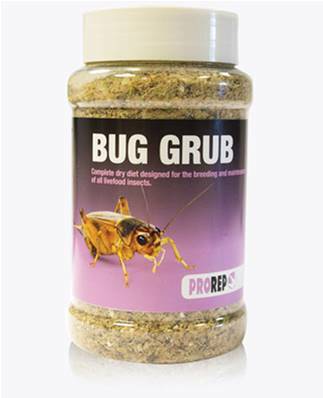 Pro-Rep Bug Grub is a complete diet for the maintenance of all common feeder insects including Crickets, Locusts, Cockroaches and Mealworms. Based on the diet used by commercial insect farms, ProRep Bug Grub provides all of the protein, carbohydrates, minerals and vitamins needed to keep your live food healthy, along with extra calcium to help boost the calcium intake of your reptiles. Simply feed a little each day in a shallow dish. Always ensure that a source of fresh water or a little fresh veg is available for moisture but beware of creating too much humidity in the cage. Provide fresh food daily in a shallow dish. Analysis: Protein 16%, Oil B 4.5%, Fibre 17.2%, Ash 11%, Moisture 13.8%, Magnesium 0.3%, Vitamin A 5000iu/kg, Vitamin D3 500iu/kg, Vitamin E 20iu/kg, Selenium 0.05mg/kg, Copper 30mg/kg.